Do you recognise this hideous creature? If so, you have my sympathies. While I’ve worked for bosses who’ve been journeying along their own toxic pathway (destination Fukushima), I’ve been fortunate enough never to have worked for a truly toxic manager. I’ve observed them though, oh yes! Actually, it would be more accurate to say I’ve observed their impact. Teams cowering in dread each Monday morning… waiting to find out whether their boss will skip through the doors like an excited eight year old on Christmas morn, or burst through to the distant sound of Carmina Burana; thunder & lightening circling their head and the hounds of hell gnashing at their feet. So how do you know if your boss is toxic? Some might think the signs are obvious, but how do you identify a truly toxic boss, rather than one who’s just unpleasant or hideously inept? Disregards or supports the incompetence of others (as suits their needs) – so a boss who’s not bothered if you need help because you can’t do something, who may be quite happy with you not knowing (so they can keep the knowledge all to themselves) or might actually brush over the fact that so-and-so can’t do something because they quite like them. Authoritarian – Suppresses criticism and demand compliance. This is a boss where any questions, queries or challenges are off the menu. There’s no discussion with this boss – it’s their way or the highway. I’m not a psychoanalyst, but no doubt this is because of two factors: 1. because they see themselves as the only one capable of deciding what to do & how to do it, and/or 2. they’re actually quite insecure about themselves and view even the most constructive & healthy challenge as a threat. Builds a dynasty of subservience – They like to be worshipped & held on a pedestal; for their position, their knowledge, their power. I suppose this actually puts into perspective their other behaviour. 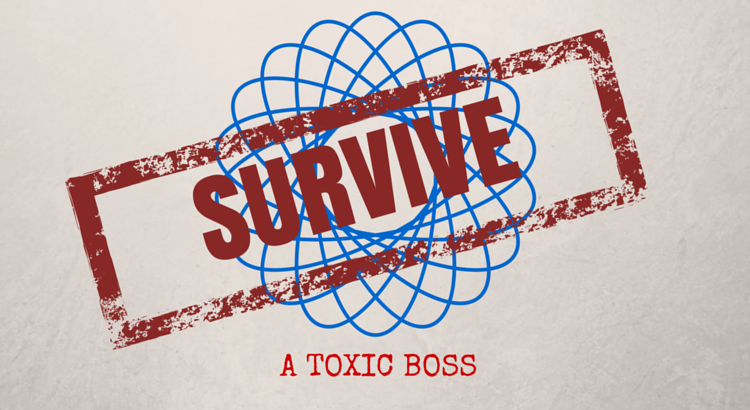 So if you’re working for a Toxic Boss, what can you do to survive and thrive… in spite of them? I’m not a HR Professional and I’m not well-versed in employment law, so I’m not going to give you any advice of that nature. But what I would say is that you need to protect yourself. You need to speak to your HR Department, senior manager, employment assistance people or an independent body (such as ACAS or CAB) who are able to provide robust and informed advice. Ultimately, if your boss has strayed into the realms of bullying – if they’re flouting your department’s employment policy, ignoring your legal and human rights or impacting your health – then you have to do something. As much as you might not want to – and believe me, I totally get that – you have to take that step. You are worth far, far more than treatment which erodes your dignity, your confidence and your sense of self. This is one that’s easier said than done… you need to become completely impervious to the effects this person has. Now I totally appreciate the injustice of being the person to adapt when someone else’s behaviour is unacceptable. However, until that behaviour is resolved (which will hopefully be quickly if you’ve followed step 1), you still have to work with them and for them and you still deserve to survive & thrive at work. An important step to achieving that is to create distance. If you can create a distance between you and your boss, so you see less of them or interact less with them, then definitely make it so. However, most people won’t have this option. Which is where emotional distancing comes into play. Start by monitoring your day. What do they do or say which affects you? How does it affect you and why? For example, “Jeff comes to work in the morning and ignores everyone – even the people who go out of their way to greet him. It makes me so mad, it’s such rude behaviour and yet he took me to one side last week to say I was rude when I didn’t say hello to him in the afternoon”. In this instance, you’ve identified the behaviour (not greeting people in the morning), how it affects you (it makes you feel frustrated & angry) and why (because you consider it rude & hypocritical). Once you’ve recognised exactly what behaviour is impacting you, how and why, you can begin to distance yourself in relation to it. Next time Jeff ignores you in the morning, remind yourself that he does this every day. Today is no different. You can choose to get het up and annoyed by it, or you can choose to see it for what it is… unfortunate and unacceptable behaviour. Yes, it might be rude, but you only have control over your own behaviour – and you know that you’re not a rude person. You are a polite person and can hold your head up high. Unacceptable behaviour is just that… unacceptable. And while we can’t control the behaviour of others, we do still have a magnificently powerful gift in our hands – the choice of how we let it affect us. It’s rational to feel annoyed, frustrated or hurt by the unnacceptable behaviour of a toxic boss; but true justice emerges when we find the strength to allow that behaviour to wash over us, leaving ourselves unaffected by its toxicity. Don’t let the behaviour of others destroy your inner peace. I mentioned earlier that you deserve more than to be adversely impacted by the affects of a Toxic Boss. That sentiment extends beyond your workplace. If you’re worried, anxious or concerned in the workplace, it’s natural that it would filter into your non-work life. The cup of coffee with a friend where you’re not really “in” the conversation, because you’re worried about tomorrow morning. The time playing lego with your children when you were distracted by concerns about the response to that report you submitted just before you left work. In these instances, the impacts of toxicity have extended into your “life” life. You may not realise it, but again you have a very powerful weapon in that armory of yours… choice. As difficult as it might be, you can choose to leave work at work and refuse to allow that toxicity to touch any part of your personal life, relationships or enjoyment. Start by building clear boundaries into your daily schedule – these boundaries could be physical, time-based or something else. For example, you might choose the door to your office as that boundary. Whenever you walk through it on your way home, imagine it slamming shut behind you – shutting off your workplace, your work, your boss and all your work-based worries. Tell yourself that there’s nothing you can do about anything behind that door until it reopens, and that door will remain shut until you go back to work tomorrow. If you are tempted to think or speak about work, then consider only doing so to share your successes. A study by the University of Minnesota proved that workers who wrote down the positive points from their day demonstrated significantly lower stress levels. So if you do feel compelled to discuss or think about work, then write a brief summary about what you’ve achieved that day your diary, or tell your significant other about that day’s successes over supper. Not only should this lower those stress levels, but it should also serve to anchor your thoughts outside work to something positive about work. Your home life is a precious, precious thing. It’s where you spend time doing things you like with people you love. You therefore deserve to enjoy it untouched by the affects of a toxic boss. I know, I know… bear with me on this one. Right now, you’re probably thinking two things: (a) “why should I have to be the one to leave” and (b) “I can’t just leave, I’m not made of money”. Let’s take them in turn. As far as the first one goes, I totally agree! Why should you be the one to leave your place of work because of someone else’s inappropriate behaviour? But the fact is, if that behaviour is already continuing unchallenged by ‘the powers that be’, it’s unlikely ever to change. And if that behaviour is impacting you to the point where it’s affecting your happiness, your confidence and your health, then you need to seriously consider what’s more important: winning the moral battle and losing yourself, or stepping away from the battle to hold onto what really matters. When it comes to the logistical issues of leaving (i.e. money and security), think “Great Escape”. Even if you can’t up and leave right now, you can always start planning. You could even start taking the steps you need to get to freedom. Start updating that CV, collecting examples of your work, bolstering that experience and applying for other roles. Not only will this practical approach help you leave your current situation, but it will remind you of just how awesome you are… something you’re probably needing right now. If you’re working for a toxic boss right now, hang on in there. Surround yourself with trusted people who’ll provide you with a confidential and strong support system. Get advice and make sure you take the right steps to get this sorted quickly and in the right way. If you’re unable to discuss with your manager because they’re a purely toxic boss, then consider speaking to someone more senior than them. Explain your concerns. Tell them what’s happening and how it’s affecting you. Give them facts; senior managers might shy away from the “she said, he said” type of stuff, but there’s no ignoring cold, hard facts. You’re not alone either – your whole team is being affected. And as much as some people would disagree with me, I truly believe that if you can amplify your voice with others speaking the same concerns, then do it. You don’t have to descend upon the CEO like the suffragettes, waving placards and chanting slogans, but you can present those very facts together – it’s very difficult to ignore a unified voice presenting verified facts & concerns. Hold on to the fact that ultimately, the problem here is not you. You are still the same person – the person who used to be happy, productive and excited in their work before this started… and you will be that person once more.